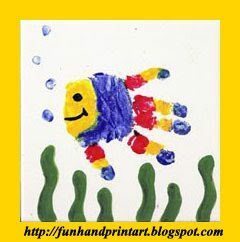 To make this super cute Handprint Fish Tile, paint stripes using enamel paint (I used Folk Art enamel paint) in however many colors you’d like across the child’s fingers. 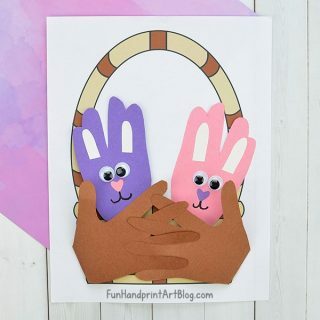 Paint a face on the bottom of the palm and then paint the remainder of the palm a different color (the blue part in ours). Press hand onto the tile. If you mess up, just wipe it off and start over. I also made bubbles with his fingerprints and painted green seaweed. When it dries, draw in the eye and mouth with black enamel paint. I sprayed it with a clear protectant when it was completely dry (it comes in a can that looks like spray paint). Simpler version of the handprint fish we made awhile back. See also: footprint angel tile. 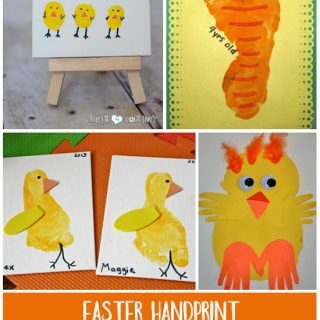 Love this idea and have linked to it today!